Yes, yet another sandpiper, but this one is the last and, besides, it’s another Asian vagrant. We found this bird in the swamp near the Far Boneyard on Gambell, St. Lawrence Island. 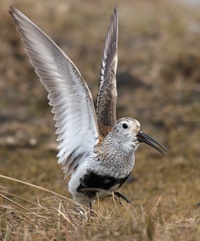 It’s found a bit more often than last week’s Terek Sandpiper, so its status is “Uncommon,” as opposed to “Casual,” meaning that it is seen pretty much every year, usually out in the Aleutian Islands. The greenish-yellow legs, whitish eyebrow and short, dark bill make this fairly easy to identify in the field. Among serious birders, seeing a Wood Sandpiper is no big deal; it was a lifer for WC. And is still the only Wood Sandpiper he has seen.